Very nice place. Beautiful next to The River. Very friendly staff. Lot of things do do. For exempel you can borrow bicycle and canoe. Very tasty food. Great nice rooms with their own large balkony. Highly recommend The hotell. The lodge is in fact an amazing place who is looking for a tranquil holiday. The room with a lovely terrace has quality facilities and the bed is really comfortable. There's only one drawback, the kitchen & the restaurant. During our 3 day-visit, they run out of this stock and that stock. For instance, we arrived on New Year's Eve, hoping a special dinner for ourselves, but they didn't have fish. The meals were average and the portion was quite small for the price. We think if they could be more generous. Next morning, at breakfast time, they ran out of basic items like milk and sugar supplement for diabetes. The staff did apologize for that, but it was really awkward. Another issue is that I requested the hotel to arrange a boat for the following day and I reminded the receptionist when we checked in and confirmed the time but the next day we found it very shocked when they didn't do anything about it. There was no boat for us. Fortunately there was a boatman for another room who left early for some reasons so we got him. Otherwise we wouldn't have to see the beautiful river. It was something I didn't expect. Perhaps the staff needs some training where there are such times as smiles and sorries are just simply not enough. Nevertheless, we love the place, the river, and the boat trip so we could come back later again. Hope they can fix those issues and improve themselves. Great hotel, delicious food and the manager was really helpful. We were the only people there so a bit lacking in atmosphere. The view from the room is lovely and we sat on our verandah enjoying a nightcap which was really nice. The only real problem was that when it rained really heavily one afternoon we came back and found our room flooded as the water had come in under the doors. Food was really great and lots of local Shan dishes. Definitely try the long bean salad! The location is quite far out of town and road is not good which is a bit of a downside, but we did a lovely boat trip when we were there which meant collection straight from hotel and was ideal. I went there on my trek around Hsipaw. 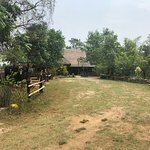 It is such a cosy resort directly at the river and belongs to the Mr. Charles Hotel and Guesthouse in Hsipaw. Next time I really need to stay there. It is just inviting. This is a very refreshing place right by the river. The only noise you hear is from cicada, I.e. no cars and dogs etc., which gives it a nice atmosphere. Rooms are great, food excellent and staff very friendly. The place organises all sorts of tracking, boat trips, village walks with good English speaking guides. We thoroughly enjoyed our stay ! Absolutely stunning place to stay. Just far enough away from the main road so that you dont hear a thing. All rooms are loving nestled next to the river, all having gorgeous little balconies overlooking the river's edge. The staff are very happy, helpful and capable. Rooms were spotlessly clean and there is enough space for a 5yrs old to run around and stay occupied. A few swings made next to the parking area. The food was very tasty and delivered to our room within a short space of time. They also offered a boat trip on the river for 35,000 kyat. One hour on the boat one hour walking around and then one hour back. We didnt do it, but spoke to another family who had done it and enjoyed it very much. I think the price is a little over priced, but I was willing to stay again just a few days later as the setting is just so idealic. A short walk up the road to look at their local Paya and eat some traditional Shan noodles for pre dinner snack while my son played football with some local kids. Gorgeous. Makes me want to buy a plot of land just up the road.